I finished my first virtual quilting bee quilt, and I am so happy with it. I had my reservations at first, but as usual, once it's all quilted and bound it takes on a new life. I debated what to bind this quilt with, and ultimately chose this great ruler print from American Jane. I love it up close, but kind of think it looks a little "dirty" from afar. Oh well, this will likely be used by my kids who love to make messes anyway. For the back I used some sheeting, and showcased one of the blocks (that was stitched by HAND). It's a lovely block. thanks to all those involved in this quilt! i love that it has a piece of each of you. what a fun year we had. Oh this turned out so lovely! 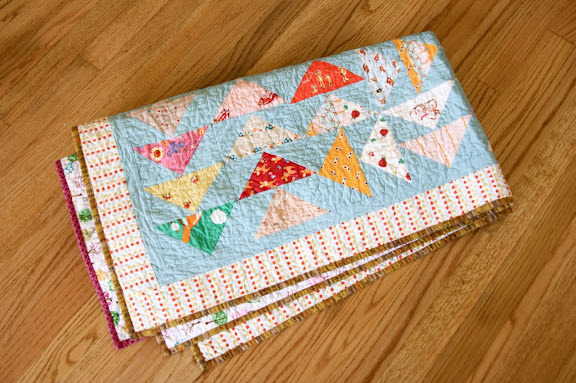 Just joined a virtual quilting bee (for the first time) and hope my quilt will be as beautiful as yours! It is beautiful. I love the blue background!! Wow - what a beautiful quilt. 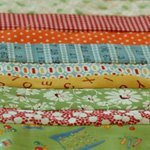 I'm part of 3 virtual quilting bees and so excited to have wonderful, handmade quilts by teams of creative minds. Thanks for sharing your final product! It turned out wonderful! I know what you mean about the ruler print. I have some in my stash and I can't seem to use it because of the shade of yellow. I am sure I will figure out a way someday. I love this...I need to join in one one of these, how fun!! Very nice. I love the color choices. this is beautiful! i love this take on the flying geese. Really beautiful. Do you remember the name of the blue? it is SO SO SO beautiful! Love the fabric choice for the binding- gorgeous! That is a beautiful quilt! Great job. It's lovely! I love the blue background. So pretty! I love the pops of colour and the blue background. I love your fabrics. Very vintage and homey. Looks comfortable. I love it! Makes me want to curl up on the couch with a good book and be all toasty warm. Wow! It is gorgeous! I love it! It turned out beautifully - I am honoured to have contributed to it. I love it! And your clor choices are perfect! Thanks to show. The quilt is wonderful...so pretty! Gorgeous quilt with a super cute model!!! it turned out wonderful! i am happy to say that i had a part in it! now if i can only find the time to get my quilt top quilted that you contributed a block for!! the bee was fun to do and i can't wait to see all the others once they are finished! Oh, thanks for sharing both those masterpieces! Beautiful! And so lovely after washing, isn't it??! Wonderful quilt, and what a great finish! I love it! And that nice blue background really brings it all together some how. That's a great Bee quilt! really pretty, and your baby looks adorable on it! At it's best in the very last picture. I think a model really makes a quilt. This looks amazing... hasn't it come together nicely! 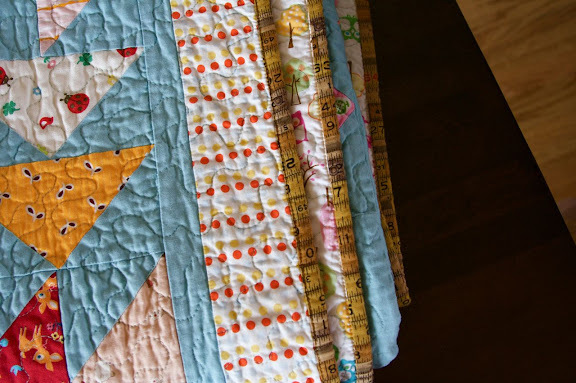 Just love this quilt! 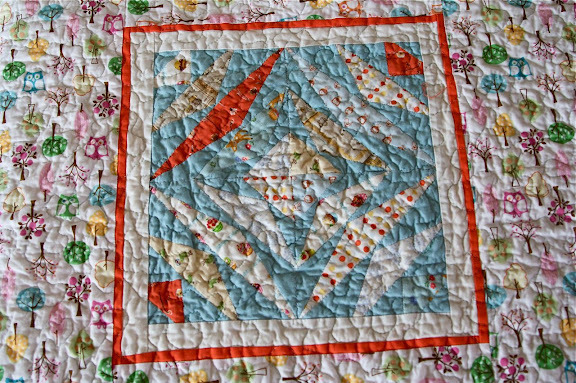 Allthe different sized 'geese' and the different directions the are flying in really moves your eye around the quilt. Very inspiring! It looks great Nettie- and so does the baby on it! refelI have visited your blog before starting my own and I just found it again, I love your quilts and you take wonderfull photos. keep up the good work. Gorgeous! I am so in awe! I adore how you used one of the blocks for the back too. Thanks so much for the wonderful inspiration! It turned out gorgeous Nettie! And how time flies! Look how big Ginger Anne is now! So glad to have been able to make a psrt of this quilt. A truely beautiful quilt - I love it! 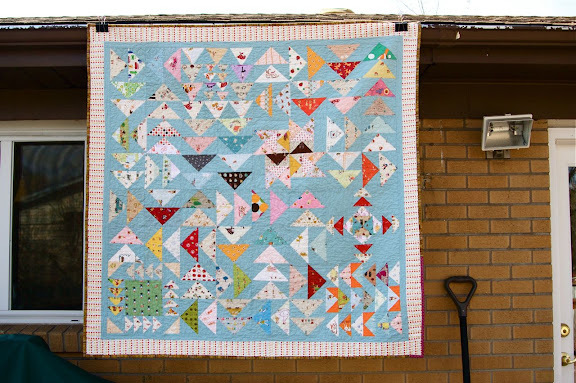 This quilt looks great - and the baby is so lovely ! hey...now you're quilt is great!!! But I'll take that baby over your quilt any day of the week!!! HA! I really really like this cross quilt! Beautiful quilt and even more beautiful baby! My daughter has the same shirt. And now you're inspiring my virtual bee selection. I've been thinking geese but wasn't sure about giving the "whatever goose block you want" directive, but I see now that it could work beautifully! oh my goodness, so completely delicious! 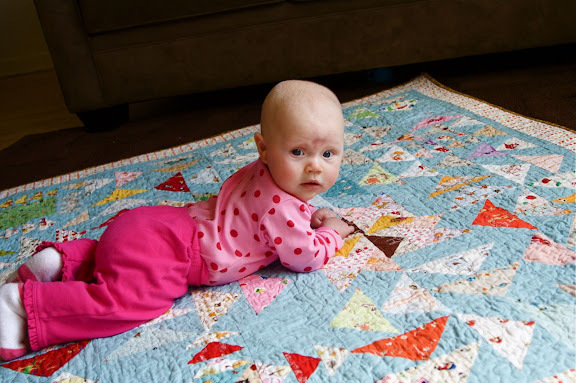 the baby and the quilt ; ) You are so inspiring to this newbie quilter! I love the patterns on your quilts. Chick I had a nightmare about my block for this quilt a few again. I'm soo sorry that it wasn't up to par. I know I hand stitched it but it should have been better. Again I'm so sorry.